E-Book publishing is one of the leading ways to make money on the internet. If you are knowledgeable in some field, it is a great idea to publish an eBook that will improve your credibility and prove you as an expert in your field. In this article, I will some ideas about how to make money with eBooks. Obviously, Once you write an eBook, your purpose is to share it with readers either by selling it or by giving it away for free. Selling your eBook on different online eBook publishing platforms can be very profitable way to make money with your eBooks. Some of these publishing platforms includes, Amazon Kindle, Create Space & Lulu. These eBook publishing platforms give you access to quality set the tools, services & allow you adopt successful eBook marketing strategies to generate more sales by making your eBook available to millions of potential readers. Instead of selling your eBook on different eBook publishing and selling platforms, another great way to earn money from your eBook is by giving it free & building your email list. This give you the opportunity to build a list of loyal subscribers and readers to whom you can sell your services and offers in years to come. You can add affiliate links on your eBook content and if the readers click those links and make a purchase, you earn affiliate commissions. If you give your readers the right to free distribute and share your eBook, you can have even more chance to increase your affiliate income as more and more people will be able to access your content that can increase the click-through ratio of your affiliate links in the eBook. If you provide any service, you can offer it to readers in your eBook to increase your profits. Let’s say you are Seo professional, you can offer your services to them for example you can also offer discounts to them or make some strategy to add value to it. This will definitely increase your chance of getting hired by them and hence it will improve your sales and income. 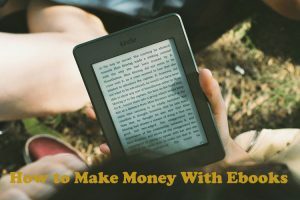 There are so many ways to make money from your eBook. All you need is to write a good quality content and use the right set of tools and tactics to reach the maximum number of readers.